Speed, Navy Carrier & Simple Rat Race . A stiff wind made conditions less than ideal for our Carrier Comp, it made slow speed flight a little difficult and getting back onto the deck a bit of a challenge. 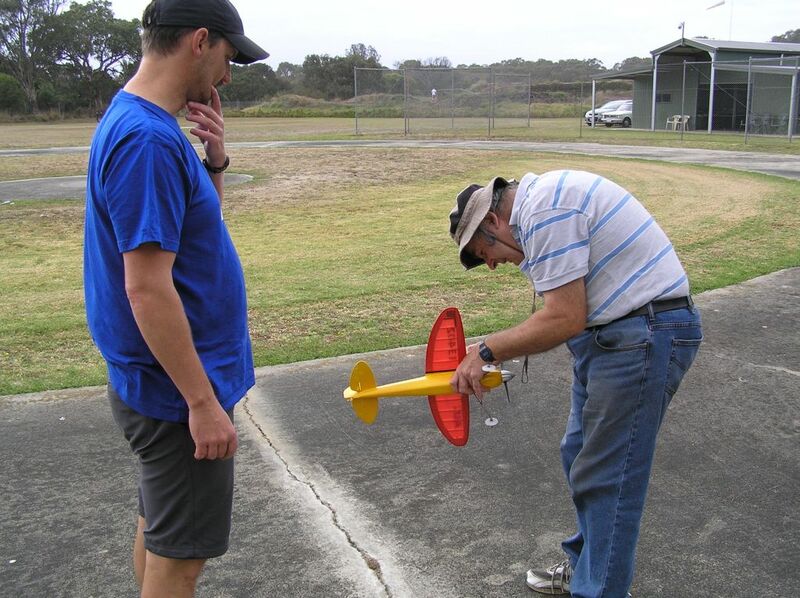 David and Noel prep a Perky Speed model for an official flight . Peter Koch was high scorer with his TT 42 powered Skyraider, mainly due to hooking a wire on his second attempt. Greame and Paul both had a few problems with their HP40 powered Bearcats, Graeme with a hook that didn’t want to stay in the down position and Paul having trouble hooking a wire or sliding off the deck. The usually reliable old Merco 29 in my Wildcat didn’t want to play ball this time and had a couple of flame outs. Big thanks to Peter K and the rest of the guys for their help in setting up and dismantling the deck. Hopefully next time we’ll get some calm weather as well as a few more competitors. Average of all 4 flyers =49.97 ,so closest is R. Hiern at 47 .48 = winner. Fastest time =A, Nugent 40.77. Thanks to Ron Savage and Phil Wake for timekeeping.